GOOD GOLLY – DON’T TOUCH THE DONEGAL HOLLY! A well-known Donegal environmentalist has pleaded with people not to cut holly bushes from the wild. Brendan McLaughlin of the Buncrana Environmental Group says he is not playing Scrooge but people are cutting off the food supply for many birds. Mr McLaughlin said people are simply pulling away a lot of holly bushes and not cutting them correctly. “People are just pulling away and tearing at the holly and it will not grow again if that is done. 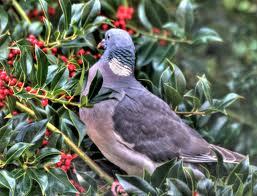 “It’s a vital source of food for the birds in the bad weather and we are certainly not over that yet. “People are not cutting it away properly and if they do not do that then the plant will wither and die away. “I have seen it all along the River Crana and many other places. I would appeal to people just to think about what they are doing,” he said.